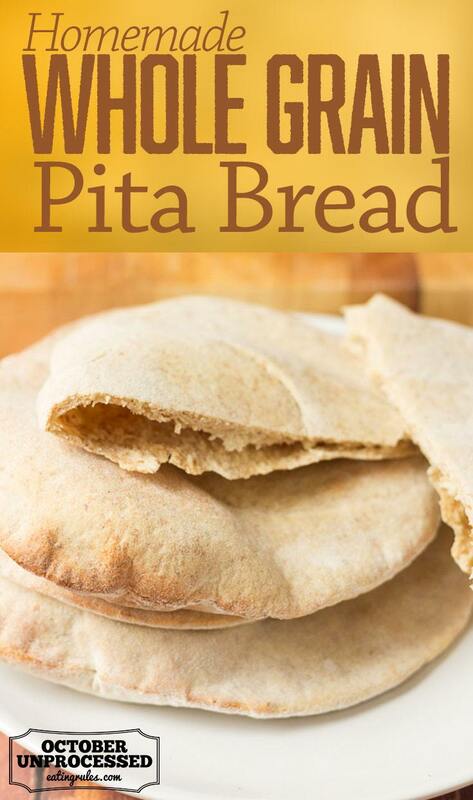 This simple homemade whole grain pita bread recipe shows you how easy it is to make your own delicious healthy pita breads. There will be no need to buy shop-made pita breads after you’ve tried this! However, it can take a little bit of time and a few attempts to master your bread making and if you’ve never tried it before it can be a little daunting to start off with too. So why not start of your baking career with this super-simple, quick, and tasty Middle Eastern flat bread that can be stuffed with all sorts of delicious fillings? And then gradually make your way up to baking a full sandwich loaf? My wife Lynne (or Lady Lynne as she’s referred to on Neil’s Healthy Meals 😉 ) absolutely loves to eat these pita breads with hummus. My preferred filling is simply to fill my pita with a healthy rocket salad. Whatever your preference of filling you can be sure that by making your own pita breads you’re not eating any unnecessary processed ingredients, which is likely what you’ll find in your shop bought ones! Enjoy! 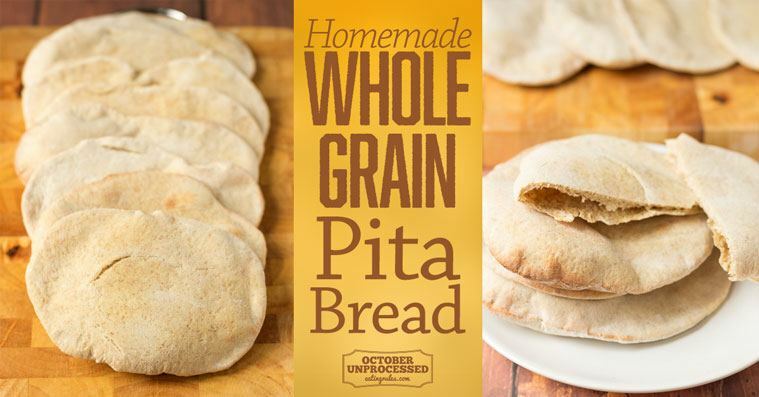 This simple homemade whole grain pita bread recipe shows you how easy it is to make your own delicious healthy pita breads. Place both of the flours into a hand mixing bowl or a stand mixer bowl, if you have one. Add the salt, yeast, and olive oil into the bowl. Gradually add the water to the bowl. Stir the mixture with a wooden spoon or use your paddle blade first if using a stand mixer, changing to your dough hook when the dough starts to come together in a ball. Lightly flour a work surface. Then tip the sticky dough ball out and knead it for about 5 minutes until the dough stops being sticky and is smooth and elastic. Add a little more flour if needed. Shape the dough into a round and place it into a clean bowl. Cover the bowl and leave it until the dough has doubled in size. This can take anything from 1 to 2 hours depending on the temperature of your room. Preheat your oven to 220C (425F) and place a large baking tray onto the middle shelf. Dust your work surface with flour again. Then tip the dough ball out onto it and knock the dough back until all the air is knocked out and the dough is smooth. Divide the dough into 8 equal pieces and form these into balls with your hands then roll each one out using a rolling pin to form oval shapes about 5mm-1cm thick. Take the baking tray out of the oven. Shake any excess flour off the pitas and place them on the tray. Bake in the oven for about 8 - 10 minutes until the pitas puff up slightly and turn a light golden brown. Remove tray from the oven and please the pitas onto a wire rack to cool for a couple of minutes then serve immediately. I make this using all 100% whole wheat. Why use white flour?